BBC iPlayer has grown in usage dramatically in the last 5 years. From just 1 million TV requests a day in January 2009, the client has now grown to nearly 6 million. The make-up of devices consumers are using has changed equally as dramatically: 80% of requests came from the PC in 2011, today over 50% comes from mobile. Daily TV requests grew 18% between December 2012 and December 2013, from 4.9M a day to 5.8M. Peak online concurrent viewership of 518,000 occurs at 10 PM, a little behind peak TV viewership of 26.2 million at 9.30 PM. Peak online viewership now accounts for 2% of the total peak audience. It is interesting to note the seasonality of the data. For the last 4 years, iPlayer saw its peak usage in February. This has been between 10%-26% larger than the number of requests in December. If this trend continues, daily requests should hit between 6.4 and 7.2 million this month. The increase in usage of mobile devices, and concomitant decline in PC usage continued in 2013. December 2012 saw the PC fielding 53% of requests, but by the end of last year the device handled just 37%. It should be noted that, while overall usage of iPlayer increased, PC requests fell from a monthly total of 77 million to just 62 million in the same period. Contrast this with tablets and smartphones. December 2012 has the devices fielding 37% of requests: by the end of the 2013, over 52% of requests came from mobile. In terms of requests, 54M requests were made from the devices. By the end of the year, this had grown to 87 million. It’s interesting to note that in the UK the tablet is rapidly becoming the go to device for video. Monthly requests from tablets grew from 26 million in December 2012 to 53 million one year later, that’s a growth of over 100%. Smartphone requests grew just 21% in the same period. 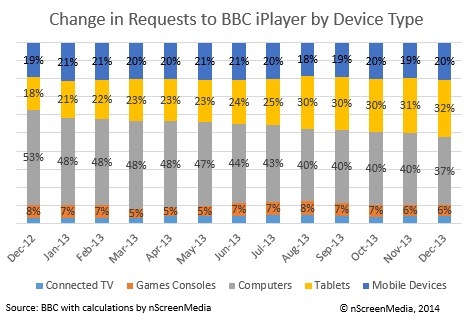 If the tablet keeps growing at this pace, it will eclipse PC iPlayer TV requests before the end of the year. In the U.S., smartphones are starting to the lead the charge in online video. Nielsen reports that 23% of Netflix users stream to a mobile, while only 15% stream to a tablet. Similarly, 17% of Hulu Plus subscribers use a mobile phone and 14% use a tablet. The smaller screen of the smartphone, versus a tablet, does not appear to be a deterrent to watching longer form video for many. Though BBC broadcast TV channels are available to UK viewers through iPlayer, the predominant mode of watching is on-demand, after the initial broadcast. 89% of TV requests were for on-demand content in December. This figure has hardly changed at all for the last 2 years, with one exception: during the London Olympics, live requests jumped from a norm of 13% before the Olympics to a peak of 32% during the games. Mobile devices are starting to drive the consumption of video online. 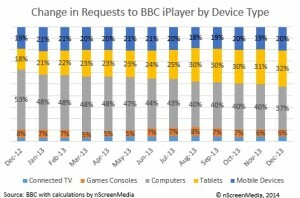 BBC data show that more than half of TV requests to iPlayer now come from tablets and smartphones. By the end of 2014, tablet requests alone should exceed PC requests.